This could very well be the perfect mountain river home! 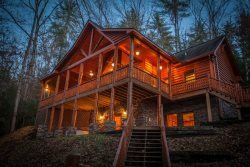 Appropriately named, "River's Bend" is a stunning custom log home that has all the comforts of home and then some! Whether you've come to enjoy the sights and sounds of the Coosawattee, or try your luck at catching spotted and rock bass which inhabit the Coosawattee, your stay here is bound to be a memorable one! From the moment you enter the front door, this home will beckon you to relax and enjoy. The warmth of ceiling to floor wood and huge windows for viewing the river from every room will take your breath away! The attention to detail that has been given to this home makes it a special water front retreat for any occasion. The open floor plan is perfect for entertaining. The great room boasts a river rock, wood burning fireplace, 50" Flat Screen TV and access to a large covered porch overlooking the river. The well appointed kitchen with five burner gas stove and all stainless steel appliances provide everything needed to prepare some delicious meals while still enjoying your company. The King Master on the main level has it's own private bath with walk in shower and jetted tub. There is a Queen Bedroom on the upper level as well as another King Bedroom and Bunk Room on the terrace level. The terrace level is also where you will find another living area with 50" Flat Screen TV, a pool table and ping pong table. Right outside on the terrace patio is a large luxury hot tub just waiting to melt your cares away after a long day of driving or exploring the area. A backyard fire pit and a hammock for napping make this a retreat you'll never want to leave. River's Bend is definitely one of those places where luxury abound and your stay here will never be long enough! This property is located in a Resort Community in Ellijay and our guests are privy to the resort amenities such as pools, tennis courts, basketball, etc., at no additional charge. *NIGHTLY RENTAL RATES ARE BASED ON 8 PEOPLE. THERE IS A FEE OF $15 PER PERSON PER NIGHT FOR EACH PERSON OVER 8 UP TO THE MAXIMUM QUANTITY. Thank you! We loved Rivers Bend! This home is amazing! The property exceeded our expectations. The cabin itself was very welcoming. We had an amazing time. Rivers Bend is a beautiful cabin in a gorgeous setting. Very high end furnishings but very cozy and comfortable. Decor was gorgeous and we loved having a fire down by the river. I would definitely come and back and recommend it to anyone. The staff was professional and courteous and very responsive with any and all requests. Our coffee machine stopped working. I called the office and one was delivered within a few hours. This property was absolutely beautiful and the location could not have been better. We are a group of women that travel together and the flow of this house worked perfectly for us. The house was beautifully furnished. We all agreed that this may have been our best house yet. If we come to this area again, we will book this property. This house is lovely. The pictures do not do it justice. We rented this to escape from Hurricane Irma, we were evacuees. It is very spacious and very clean. There is lots to do for the kids, the kitchen is big and new. They have basic amenities waiting for you. Stores and the little town are close. There are deer running around everywhere! We want to return under better circumstances to vacation. The rental company was excellent and we were very satisfied! Thanks for making a stressful trip under not so great circumstances a good stay. This home is an Oasis! Stay here! THE CABIN WAS BEAUTIFUL. IT WAS DECORATED BEAUTIFULLY. ROOM FOR EVERYONE. RIVER IN THE BACK WAS GREAT FOR THE GUYS THAT WANTED TO GO FISHING. THE KIDS LOVED THE SWING. WONDERFUL TIME HAD BY ALL. Our family ranging from 14 - 75 years of age had an incredible time at Rivers Bend. The cabin was magnificent, spacious and very relaxing. We had space to all be together in the main living room or back porch and space to seperate for alone time to rest or read. The bedrooms were a nice size and the beds were very comfortable. We also enjoyed playing pool and ping pong together. Being on the river was also a plus. We had fun floating down the river each day we were there. I would highly recommend this location to others. We definitely enjoyed our weekend at River's Bend. The house was beautiful as we expected. The pictures on your web site were accurate and showed the house very well. Details we noticed: plenty of towels in our bathroom and at the kitchen sink, plenty of garbage bags, dishwasher packets and dish soap. Excellent appliances in the kitchen, too. The notebook with general information and specific information about the house was very helpful. We loved the swing in the yard. We saw a beautiful path along the river to the left, and took a walk there. Could not have been nicer. It met all of our expectations and even more. It is not only beautiful, but also really comfortable. It was perfect for all ten of us, ranging from 5 months old to the grandparents ( not mentioning the age!). There was nothing I would change. Very glad we booked with you, and chose the perfect house.